Red Tiger Gaming takes you to Hawaii with their Tiki Fruits slot. It is another take on a fruit machine that uses the Cluster Pays mechanics (Aloha, Twin Spin Deluxe, etc). With the reels set against a beach, the slot features tiki statues that are animated and make some funny sounds. The Red Tiger Gaming release uses an 8×10 grid with no paylines. To win a prize, you have to create a cluster of 5 and more symbols of a kind. Whenever you complete a winning combo, the winning symbols will be removed from the grid and new ones will fall into their place. Other features that will boost your winning chances include Fruit Bars and Tiki Spins we will explain further in the review. Tiki Fruits slots machine continues the trend of Candy Crush lookalike slots such as Cool Jewels, Dazzle me, Sugar Pop, etc. So take a trip to Hawaii with Tiki Fruits slot and you can win up to 2,000x your bet in a single spin! Cluster Pays system. We really like when we don’t have to think about paylines. Cascading wins. Multiple opportunities to win at a single spin price. Bonus features. Fruit Bars help you remove low-value symbols from the grid to provide you with a chance to win bigger prizes. Free spins. During the feature, your winning chances will be improved additionally. Nice graphics and sounds. They match the theme of the game and add to its atmosphere. No Wilds. The game offers no substitutes that would help you form a cluster. Mediocre payouts. The top fixed jackpot stands at 777 coins while the top prize is 2,000x your bet. When not played, the game produces some awkward sounds and repetitive music. Red Tiger Gaming adds a twist to a fruit machine with the game’s structure, Cluster Pays mechanics and innovative Fruit Bars feature. Each winning combination created with low paying fruit symbols during a single spin contributes to the meters on the right side of the screen. Once you fill the meter, all instances of the respective symbol will be removed from the grid. This enhances your chances to create clusters of high-paying symbols. The meters are reset on non-winning drops during the base game. Tiki Spins are awarded when you fill the Bonus meter with coconut cocktails. A number of Tiki Spins is awarded at random and during the feature Fruit Bars are not reset regardless of your score, so you can collect fruits and get them removed throughout the feature. While playing Tiki Spins we have won 60x total bet. 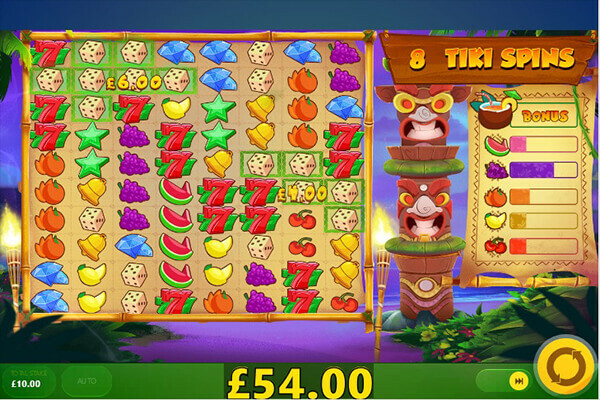 Tiki Fruits may be a weird fruit machine using a tropical theme, but it will provide you with an entertaining gaming experience for sure. It is a game of medium volatility, so you can expect well-balanced payouts as long as you play it. Our biggest prize of 60x bet was collected during Tiki Spins, but thanks to Fruit Bars and cascading reels, you can win some hefty prizes in the base game as well.